A young dinosaur and his dad search their island for a Christmas tree for their holiday celebration. 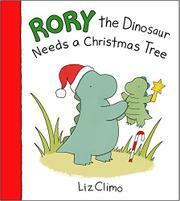 In this third outing for the little dinosaur, Rory and his group of animal friends are preparing for Christmas Eve. Rory and his dad have decorated their treetop home with Christmas stockings and garland, but they are missing a Christmas tree. The dinosaurs examine several different trees, but nothing on their lush, green island is quite right for their needs. When father and son return home empty-handed, the other animals arrive for a caroling session, followed by a Christmas story and hot cocoa. Rory’s dad surprises his son on Christmas morning by decorating himself as the Christmas tree, complete with glowing lights and a star-shaped hat. There is a jolly celebration and exchange of gifts before a sweet, concluding hug for the dinosaur duo. Digitally produced illustrations use cartoon-style shapes against plain white backgrounds or minimalist scenes of the dinosaur home and island surroundings. Rory and his dad have only tiny dots for their eyes, so they don’t show much expression, and all the characters have a rather flat and posed feel to them. The story is simple but satisfying, with the caring (and frequently used) theme of enjoying the holiday with friends and family.